Anyone who has recited the Lords Prayer knows the 23rd Psalm by heart. “The Lord is my Shepherd; I shall not want, He maketh me to lie down in green pastures, He leadeth me beside the sill waters, He restoreth my soul: He leadeth me in the paths of righteousness for His name' sake, Yea, though I walk through the valley of the shadow of death, I will fear no evil: For thou art with me; Thy rod and thy staff, they comfort me, Thou preparest a table before me in the presence of mine enemies; Thou annointest my head with oil; My cup runneth over. Surely goodness and mercy shall follow me all the days of my life, and I will dwell in the House of the Lord forever”. 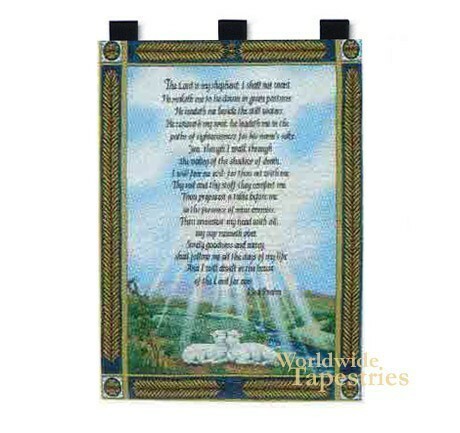 This wonderful tapestry captures the psalm in all its peaceful splendor, and will make a great addition to your home. It is lined on the back and has tabs for easy hanging.